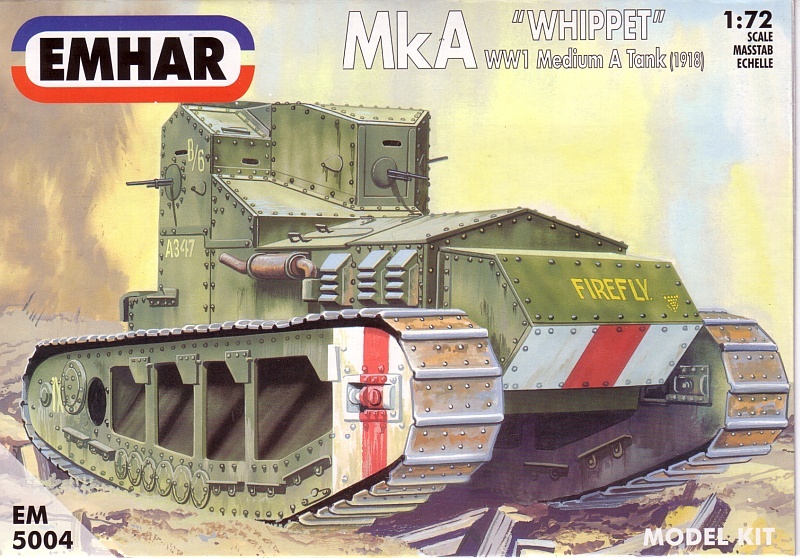 This is a simple kit from Emhar. 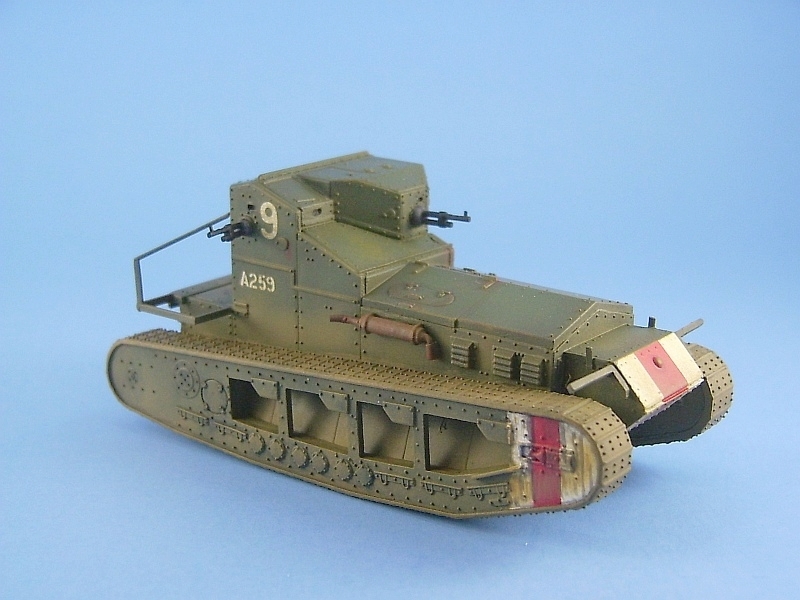 It is consists of only 22 pieces but it is a nice kit nonetheless. The plastic is a bit on the soft side but working with it is fine and it does accept liquid glue very well. 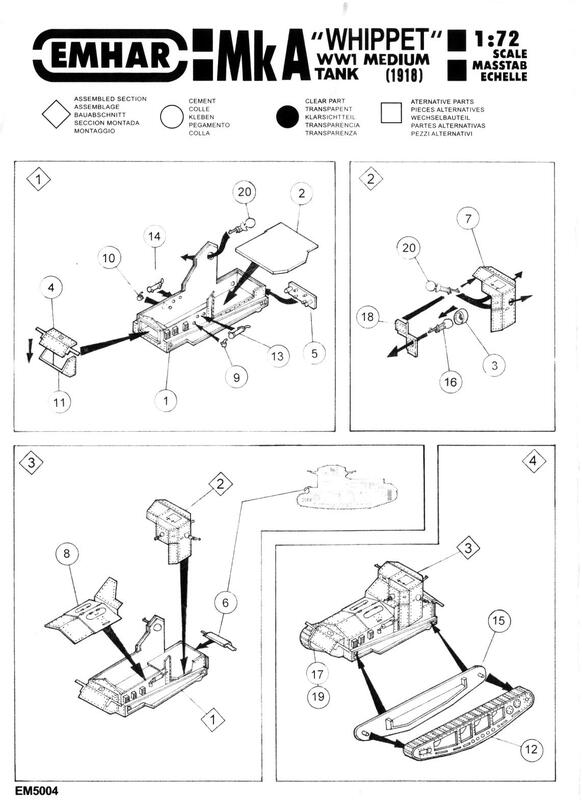 Instructions are straightforward and there are no major vices to this kit. Only sanding of the mating surfaces was needed to get parts to align correctly and minimize gaps. 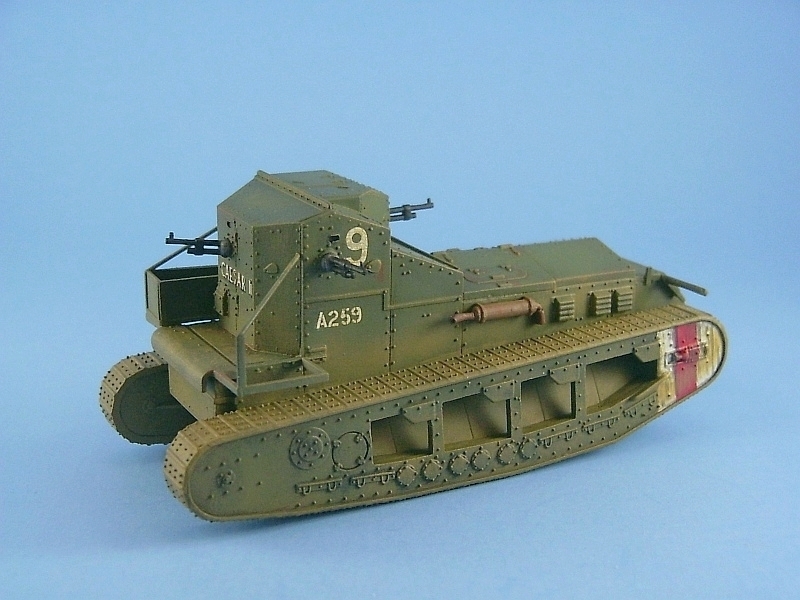 You could build this one straight from the box and have a nice representation of the Whippet, but with a little extra work to add some details, you can make this kit really stand out. I didn’t like how the machine guns (parts 16 & 20) mounted, so I backed the holes from the inside with some sheet plastic. Then the side and rear guns (part 20) were modified to remove the ball shaped protuberance and the front gun (part 16) had the rear half of the ball cut off. This allowed me to attach all of the guns after the painting was complete. I built the Whippet in three sub-assemblies: left track assembly, right track assembly and the body. To keep track of the improvements I wished to make I created a diagram of my desired changes to ensure that none were forgotten. Most of these details were easily fashioned from some plastic strip or rod, so I’ll not give details on the modifications unless they require a bit more explanation. 1. Added the missing vertical bracket behind front fender hangers. 2. Cut off and repositioned front fender hangers. These are reversed on the base kit. 3. Added missing brace plate to front of tracks just below the tensioner bolt. 5. Added horizontal support braces in front of return rollers. 7. Added an extra track spud hanger rail below left machine gun with some thin plastic strip. quite well but still needs a bit more practice on my part. I cut a piece of plastic insulated wire to length. hole, with the copper wire end inserted into the hole. kit and it’s quite puzzling as to how they could have been missed in the first place. and drilled out a hole for the tow hook. 16 & 17. Added left storage bin and framing and the framing for right storage bin, but not the bin itself. tarps and/or tools to the left bin to just fill it out a bit instead of having that gaping empty space. 19. Added the missing drip rail to top front of cabin below the front gun. 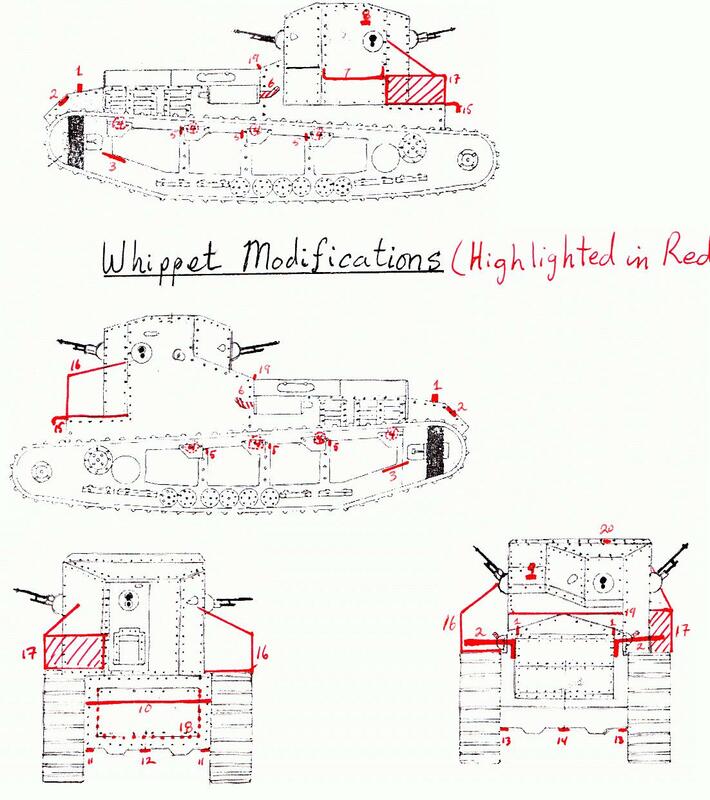 The decal sheet contains markings for no fewer than eight Whippets. The decal sheet is excellent. The images settled down beautifully after a good soaking in Microsol. The white decals are opaque enough that the underlying dark camouflage doesn’t show through and darken them. The white/red/white identification bands are supplied on the sheet but I chose to paint these instead. I chose the markings for Whippet number A259, which is the Whippet of Victoria Cross recipient Lt. Cecil Sewell. Below is the citation from Wikipedia on his actions with Whippet A259. “Cecil Harold Sewell VC (27 January 1895-29 August 1918) was an English recipient of the Victoria Cross, the highest and most prestigious award for gallantry in the face of the enemy that can be awarded to British and Commonwealth forces. He was educated at Dulwich College between 1907 and 1910. He was 23 years old, and a Lieutenant in the Queen's Own Royal West Kent Regiment, British Army, attached to 3rd (Light) Battalion, Tank Corps during the First World War when the following deed took place for which he was awarded the VC. Not mentioned in the Wikipedia article is the fact that in his attempt to return to his own tank, Lt. Sewell was struck by enemy fire and later succumbed to his wounds. 4. Then a pin wash of Testors Flat Black in paint thinner was applied to the seams and other places and also on the sides of the track units to hopefully replicate oil/grease runs. Flat black was also sprayed on the tracks after masking to prevent over spray onto adjacent panels. 5. All the edges on the body received a brush application of Testors #1711 Olive Drab thinned with paint thinner. Then the kit was left to dry another day. 6. The final weathering was a dry brushing of Aeromaster #9094 Earth Brown overall, keeping most of it to the lower third of the tank. 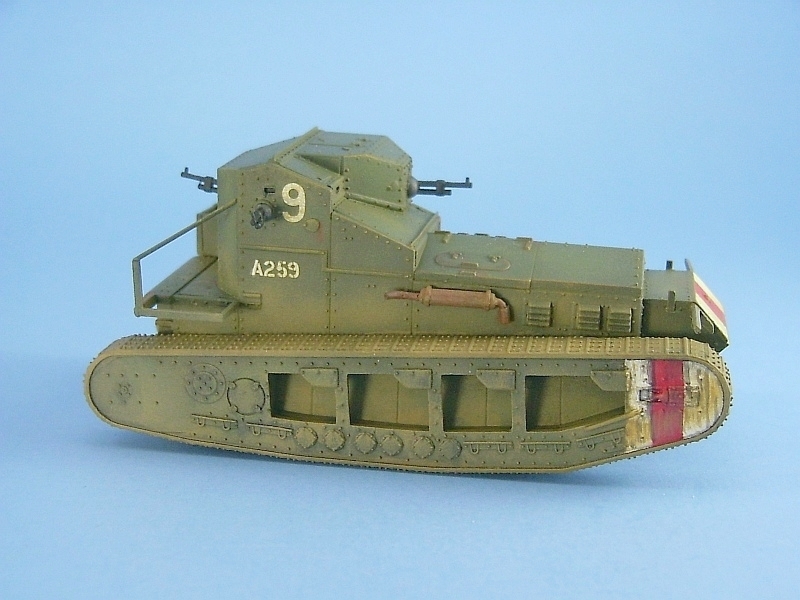 Then I took some of this same paint, thinned it to a water like consistency, and airbrushed a light coat on the model, again keeping in and around the lower third of the tank and also concentrating on the tracks to give them a dirty/dusty look. 7. The last touch was to add some vertical streaking to the body panels with some olive drab and khaki paint and to the front of the track assemblies with brown and black paint. 8. Finally after a couple more days to dry, the final coat of Aeromaster Acrylic Flat was sprayed to give a nice uniform flat sheen to the model. Following the painting all that was needed to finish the build was the gluing of the sub-assemblies together. 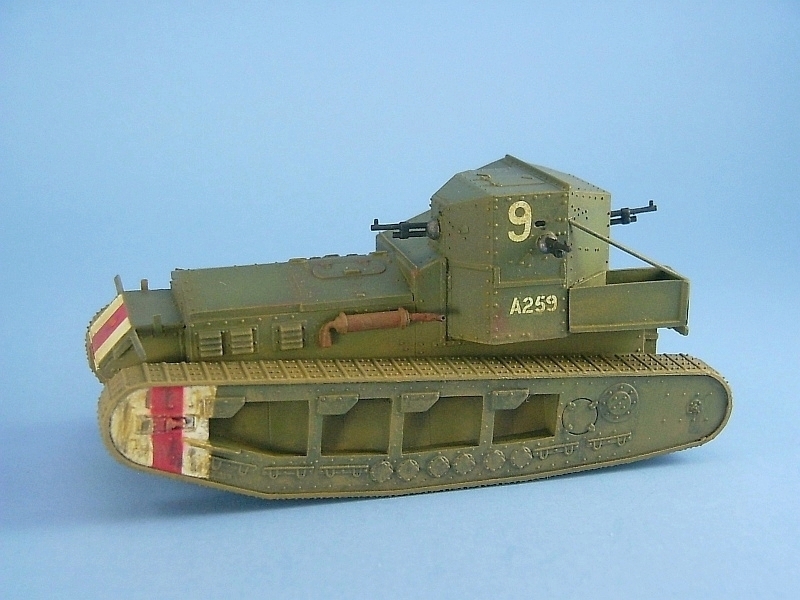 So, if you want an easy and fun kit to build, then locate one of these and have a go. Straight from the box it makes into a nice little kit, but with a little extra effort it can be made into a standout.